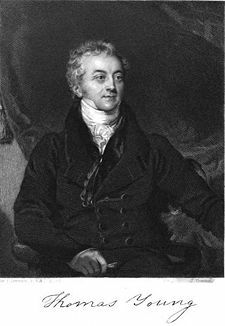 In 1801, the brilliant physicist Thomas Young discovered phase shifting of light waves. We use this technique today to produce 3d ultrasound pictures. He found that there is an interaction between light waves coming from two different sources. They can combine to become stronger (constructive) or cancel each other out (destructive). This depends on the shifting of the light sources. His apparatus used two light sources and a wooden board with two holes in it. The light that went through the holes created waves, like ripples in a pond when a stone is thrown in it. He could focus, aim or shift the lights so the wave patterns intersected with each other. Phase shifting, or phasing started to be used in the 1960's in phased array systems. They used multiple transducers that pulsed transmitted sound waves to control interference patterns. Young's work was used from the 1960's on in 3d ultrasound images which produced cross sectional pictures of a patient.